Finally, a cold front has made its way down to the sunshine state! I can fully embrace all of my winter jackets and coats for the next three days. Yep, just three days until it's back to the sunny 80s! 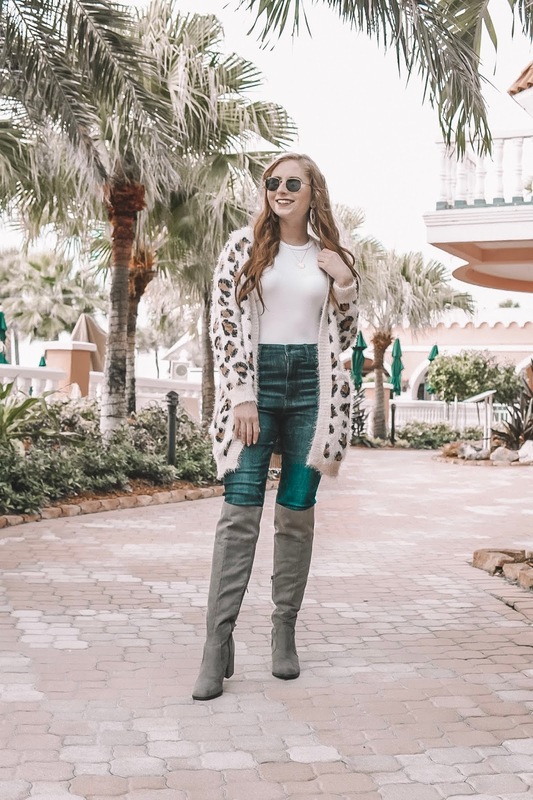 Speaking of jackets and coats -- this cardigan is a new piece from Charlotte Russe that I was lucky enough to be sent over from the Charlotte Russe team! That's my new motto; especially for the winter. I already have a cozy pair of leopard printed loafers from Wal-Mart that I continue to wear with a simple pair of jeans and a comfy t-shirt. This cardigan ($18.59) has fuzzies all over it, too. I felt super warm walking around the Don CeSar taking photos of my various outfits for the week. This time of year, the Don CeSar is usually quiet, so it's the perfect backdrop for taking photos. Of course, in true Florida fashion, a gorgeous pink and orange sunset quickly filled the sky as soon as 5:45 pm came around. I love taking photos by this iconic pink hotel! It's such a classy place, too. I stayed overnight here for my sixteen birthday and my best friend and I had a ball. We ordered room service, enjoyed lounging by the pool for hours, and slipped into the hot tub at night. It's truly a luxury hotel and if you ever stop by St. Pete Beach, be sure to park for a few hours in their massive parking lot out front to spend some time embracing the entire location for all of its accomodations.